In 1985, I started working for a large homebuilder in Columbus, Ohio. After 18 prosperous and great years, the owner passed away and the company dissolved. In 2003, still in Columbus, Mark and I started building houses then in 2006, we moved our company to Boise, Idaho knowing that, if we found Boise to be a desirable place to live, others would too; therefore, we could build and sell houses. Our strategy worked well until the downturn of the housing market. We built our last houses in 2008. What markets would be most interested in your Flip Out TV mount? 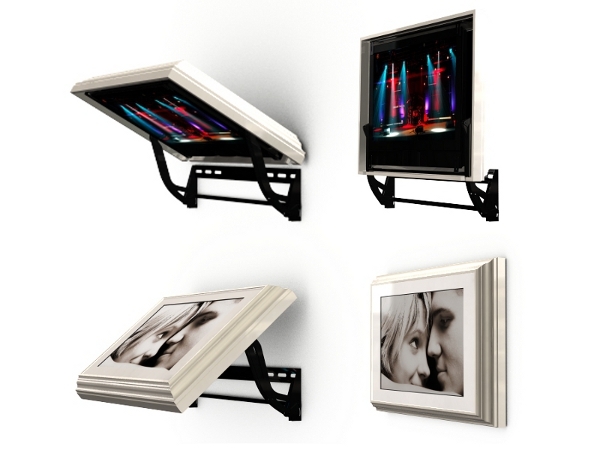 The Flip-Out TV mount has two markets, the medical industry as a need and the consumer industry as a desire. With our aging population and the health issues that go along with aging, forces some individuals to be less mobile and in some cases restricts mobility to a point to where your doctor, for medical necessity, requires you to lay flat on your back. Now, imagine yourself stuck in bed, face up with absolutely nothing to do. You think to yourself how amazing it would be to have a TV above you so you’re not completely bored. Even if your reason behind wanting to watch TV is not medical, you can still have the luxury without a prescription. Let us say you love to lie in bed on a lazy night and watch TV or a movie with your loved one and/or play video games. You can with a hidden visions television mount. Standard Flip-Out: This will allow your television to extend out, reducing back, and neck pain by watching TV in your natural resting position. 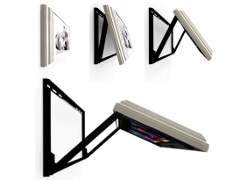 Extended Flip-Out: This luxury wall mount extends your TV over your bed and tilts it to the perfect angle for comfortable viewing while sitting up or lying down. When closed, it completely hides your TV behind a beautiful picture frame. A brilliant person with idle time created the Hidden Vision TV mount. He was establishing his own environment by building furniture for his new home, then decided to market the TV mount to the public. How have sales been both in the US and overseas? We are a USA based company; sales are generated from the internet and word of mouth. The interest outside the United States is surprisingly high; I am sure in the near future we will expand the distribution of your product. Unfortunately, I do not receive a lot of feedback from customers. The emails I receive, just from the website “contact us”, show an interest in a motorized Flip-Out and Flip-Around Hidden Vision mount. We are proud that our TV mounts are easy to operate manually but we have learned we need to offer a motorized version too. Therefore, in the very near future, you will see the option on our website. Our motorized prototype will be on display at the HITEC show in Baltimore Maryland at the end of June. What is involved in the mounting of the product? Is it something that requires a professional or can it be done by the end users? We have designed our mounts so you install the bolts first. Then you can hang the mount on the bolts, level the mount, tighten the bolts, and you are done; it is pretty sweet. Installing the TV is easy as well. 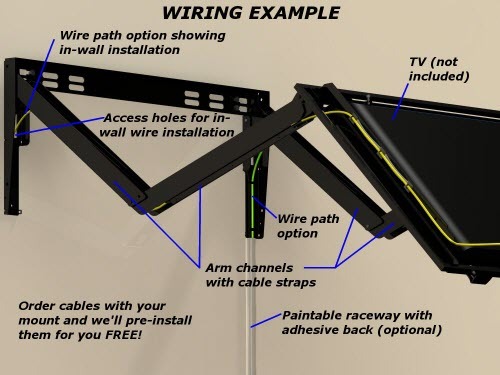 Once the mount is installed simply, set the TV in the mount, adjust the rubber holders, and tighten them down to hold the TV in place.